There are some advantages to building your own wooden wheels. First, it is cheaper to make your own wooden wheels than it is to buy metal ones. Second, it's also far cheaper to make necessary repairs to wooden wheels. All you need are a few basic woodworking tools and good quality wood. 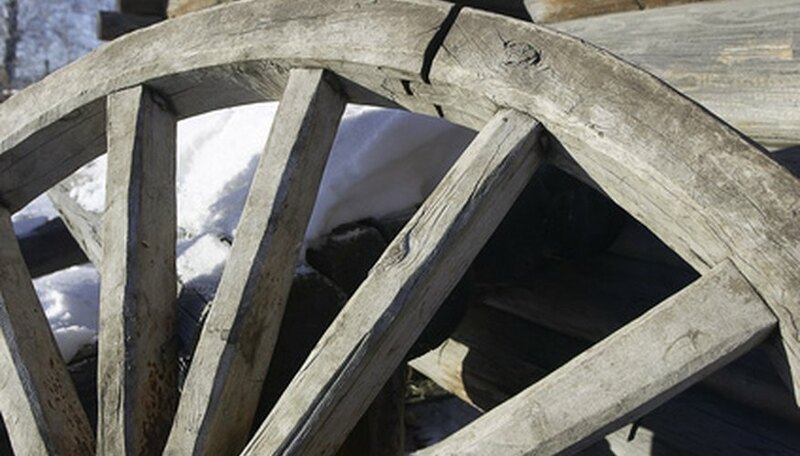 Keep in mind that the wheels must support the stagecoach's weight, so make sure to use sturdy wood that is in good condition. Determine what size you want your wheel to be and make a paper pattern of it. Trace a circle on the paper that is the same size as your wheel and cut the circle out. You'll now have a large, solid paper circle . Fold the solid paper circle in half and cut out the middle so that you have a round paper band that is as wide as you want your wooden wheel to be. Cut the paper band in half, then cut the resulting semicircular band in half. You should now have 1/4 of a band. The 1/4 band will be your pattern, or template, for making the wheel frame. Take the piece of 1 1/2-inch thick wood. Put the 1/4 band template on it and trace its outline four times. Cut out the four bands of wood with a jigsaw. Take the block of wood and put it on the lathe, where you will turn it and round out the edges with a chisel until you have a cylindrical block. This will be your wheel hub. Make sure the hub block is 1/5 the size of your wheel. Drill a hole through the hub block with a hole saw that is wide enough for the axle you will use in the wheel. Figure out how many dowels you will need. The number of dowels depends on how many spokes your finished wooden wheel will have—each spoke gets a dowel. Drill holes for the dowels around the center of the hub. The holes should be evenly spaced around the center of the block so that they hold the spokes correctly. Fit the dowels into the holes and set the block aside. For example, a 14-inch wheel has eight spokes, so it would get eight holes for dowels. Place the four wheel frame pieces around the dowels. Mark each point where a dowel needs to enter the frame pieces onto the frame pieces themselves, drilling holes through each mark. Take the hub and pull out the dowels. Put wood glue into each hole and press the dowels back into the holes. Use a mallet to secure the dowels into place. Take the four wheel frame pieces. Put wood glue into the holes in all four pieces, as well as on the ends of each piece. Press the four wood wheel frame pieces onto the dowels. Use the mallet to secure them into place. Put vise clamps around the finished wheel so that the clamps hold the four now-assembled wood frame pieces together, and leave in place until the glue dries. Once the glue dries, remove the clamps. Your wooden stagecoach wheel is now ready for use.